Israeli Prime Minister Benjamin Netanyahu meeting Palestinian Authority President Mahmoud Abbas during the state funeral of late Israeli President Shimon Peres, 30 September 2016. Photo by Amos Ben Gershom. Doron Matza proposes a new critical paradigm to understand the relationship between the Israeli and Palestinian leaderships: ‘cooperation between rivals’ i.e. an informal ‘deal’ between the political elites. 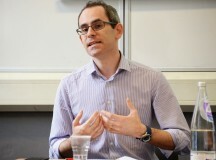 He argues that the paradigm emerged as a response to the second intifada in 2000 and the Arab Spring in 2010 which led both Israeli and Palestinian societies – frustrated, exhausted, disappointed with negotiations and sceptical about peace – to turn inwards, and also towards a new and heightened level of collaboration between Israel and the Palestinian systems in order to preserve the status quo. Matza also explores the defining features of the new model, including turning the diplomatic arena into an ‘agreed conflict zone’, the multiple benefits this offers the leaderships and sectors of both societies, before turning his attention to the ‘losers’ on both sides, and to what he sees as the immorality and unsustainability of ‘cooperation between rivals’. In the broadest sense, people tend to think about society in the terms of one of two dichotomous theories. Some favour functionalist theory which views society as an organism, each part of the social structure fulfilling a specific role, enabling society to function smoothly. Some prefer to see society in terms of conflict theory, which regards society as an arena of conflict between different political groups, each seeking to organise society on the basis of their interests. The transformation of the Israeli-Palestinian relationship over the last two decade suggests that a combination of these two theories is needed to understand it. On the one hand, the conflict-driven aspect of the relationship, based on national, religious and ethnic rivalry, remains. On the other hand, there are important dimensions of their relationship which reflect cooperation and symbiosis between the two sides. Since 2005, the year in which Mahmoud Abbas (Abu Mazen) replaced Yasser Arafat as the president of the Palestinian Authority (PA), a new dynamic has been created in the Israeli-Palestinian relationship, which I call ‘cooperation between rivals’ – a dynamic that has effectively maintained the stability of both governments, amid a particularly tumultuous period in the post-Arab Spring Middle East. Even the latest wave of violence which began in October 2015 – referred to by a myriad of names including the ‘third Palestinian uprising’ and ‘the lone-wolf intifada’ – did not seriously damage this new dynamic. On the contrary, it only made more apparent some of its main characteristics, not least the high level of collaboration between Israeli and Palestinian systems. The new dynamic of a ‘cooperation between rivals’ developed out of two major events in the Middle East; the second intifada in 2000 and the Arab Spring in 2010. These constituted the background that led both Israeli and Palestinian societies to become frustrated, exhausted and disappointed with negotiations, and with the notion of ‘peace’, and to turn inwards, becoming more focused on the economic and social matters that have an influence on the daily lives of their constituents. This shift in focus from peace negotiations toward internal socio-economic matters led to the establishment of the ‘cooperation between rivals’ dynamic. The second intifada marked a turning point in the Israeli-Palestinian conflict. The outbreak of violence, coupled with the collapse of the peace talks at the Camp David II summit in July 2000, put an end to the two-state concept, in part by cementing among the Israeli public the notion that there was no Palestinian partner and that brokering a final-status agreement through negotiations was therefore impossible. The collapse of the talks was one of the factors that helped strengthen the ethno-national stream of Israeli politics over the liberal stream, signalling the beginning of the rise of its hegemony as well as policies seeking to implement measures that would prevent the establishment of a two-state solution. On the Palestinian side, the intifada weakened the traditional secular-dominated leadership of the PA, as Israel became more dominant in the West Bank in the aftermath of Operation Defensive Shield (Spring 2002). These developments shifted the focus in the Palestinian arena from prioritising the pursuit of peace, to economic and other day-to-day problems of Palestinians living in the territories. 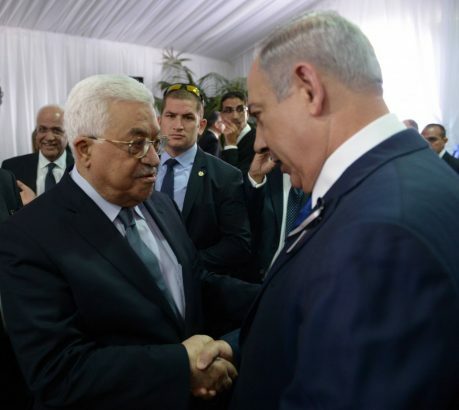 One direct result of this shift in focus was that it exposed the PA’s corruption, which subsequently paved the way for the now-eleven year rift between Fatah and Hamas, the Islamist movement that has ruled in Gaza for nearly a decade. This was not only a significant political event but it also symbolised a shift in public opinion away from prioritising the peace process – the platform of the secular-led Palestinian leadership – towards the economic and social agenda that was identified with the Islamic movement. Hamas, like many on the Israeli right, also had an interest to stymie progress on the peace process. Neither the Israeli nor Palestinian leaderships were insulated from the wave of social and political protests which swept the region in 2011. The ‘Arab Spring’ was a popular uprising against the old political hegemony and the neo-liberal economic system that was identified with the ruling Arabs elites. Thus, even though the Palestinian leaderships in the West Bank (the PA) and Gaza Strip (Hamas) largely escaped the upheaval, they still feared that the wave of change sweeping the region could threaten their own rule, due to their failure to promote their main agendas – peace with Israel (for the PA) and economic and social prosperity (for Hamas). This mutual fear brought Hamas and Fatah to some degree of collaboration, although the two remain rivals. Their willingness to be seen to cooperate with one another – a shared desire of their respective constituencies – was reflected in their several public attempts to establish a unity government and promote free elections, all of which eventually failed. The Israeli leadership also faced the impact of the ‘Arab Spring’ when the social protests began in the summer of 2011. 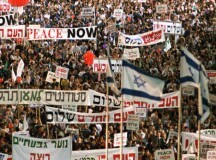 What began as a protest in the centre of Tel-Aviv when young students established a tent encampment on Rothschild Boulevard protesting the high prices of apartments and basic products, developed into a social protest against Prime Minister Benjamin Netanyahu’s government and the neo-liberal economic system. The fact the protesters were predominantly middle class reflected the reality that hundreds of thousands of Israelis had seemingly lost their interest in Israeli-Palestinian matters and were now primarily focused on socio-economic issues. This also led to two newly established political parties emphasising socio-economic issues from the centre-left (Yair Lapid’s Yesh Atid) and centre-right (Moshe Kahlon’s Kulanu) gaining seats in parliament, becoming large parties and important partners within the ruling coalition. Both the Palestinian and Israeli leaderships have thus found themselves facing similar challenges and having a joint interest in constructing a metaphorical wall to block the winds of change from the ‘Arab Spring’ that would endanger their political position. In short, the dynamic pushing both leaderships away from peace negotiations and towards internal socio-economic matters led to the establishment of the new framework for the relationship – ‘cooperation between rivals’ – which rests on four elements. Firstly, there is an understanding within the two leaderships that the concept of peace has become irrelevant, mainly due to the different perspectives each side has on what a final status agreement should look like. The Palestinian leadership has maintained the idea of the ‘two-state’ solution based on the ideas proposed in the ‘Clinton parameters’, of a sovereign Palestinian state free of Jewish presence in the settlements. Yet the Israeli interpretation of ‘two states’ has dramatically changed as a result of right-wing parties becoming dominant players in the ruling coalition. This perspective calls for a weak Palestinian state, or in the eyes of some powerful political elements such as Naftali Bennett’s Jewish Home party, Palestinian autonomy in the West Bank (what Bennett called ‘autonomy on steroids’) alongside continued Israeli civilian and security presence and Jerusalem as the sole capital of the Jewish state. The gap between the two sides over these final-status issues has led both leaderships to conclude that for the immediate future, they would be better served by focusing on socio-economic policies, and incremental steps to improve the daily lives of both Israelis and Palestinians, in lieu of continuing to advance towards a final-status agreement. The second element is the shared interest of both leaderships to maintain political stability as well as their willingness to cooperate with one other to achieve it. This cooperation has taken the form of a ‘package deal’ combining political, security and economic dimensions. On the one hand Israel has shown willingness to enable and improve the model of autonomy for Palestinians in the West Bank, which has allowed them to build a bureaucracy that handles civic life and generates economic benefits that enable the PA to offer the population a kind of social prosperity. At the same time, the PA has demonstrated a willingness to take responsibility for law and order and to offer greater security for Israel by preventing terror attacks and by reducing Hamas’s political power in the West Bank. Israelis refer to this as ‘economic peace’ – security for Israel, economic stability to the Palestinians. The third element, which is particularly significant, is the will of both leaderships to preserve an open dimension of conflict between them, despite their cooperation in other areas. Cooperation can be unpopular. From the perspective of Israel’s leadership, working with the PA not only contradicts much of the government’s political discourse towards the Palestinians, it contradicts the political aspirations of key elements in the Israeli right-wing, who would prefer to see the PA’s destruction and who call for annexation of the West Bank. From the Palestinian side, cooperation with Israel can mark Abu Mazen and the PA leadership as collaborators who enable the continuation of the Israeli occupation. Therefore in order to disguise the amount of cooperation, the two leaderships have created a situation in which they continue the conflict but in a limited way that will not have too negative an effect nor cause a resumption in violence, which would destabilise the situation and destroy this new emerging equilibrium. In this context the diplomatic arena has become the ‘agreed conflict zone’ between the leaderships. Like a play in which each actor has his own role, the Palestinian leadership challenges Israel in the UN and other international organisations while Israel calls out the PA for incitement and for advancing a de-legitimisation campaign against it. The two sides are thus able to demonstrate their dedication to their national goals while continuing their joined project of mutual cooperation. The fourth element the model is the continuation of political discourse surrounding ‘two states’. Since the collapse of the negotiations at Camp David II in July 2000 and the start of the second intifada, the paradigm of the two-state solution has been significantly weakened. 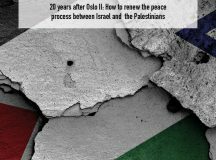 For the Palestinians, the ‘two-state’ discourse reflects a lost dream and the PA’s continued support for it (despite the many challenges in achieving it) indicates its difficulty in abandoning the goal of an independent Palestinian state through negotiations. In Israel the two-state paradigm was supplanted by the notion that there was ‘no [Palestinian] partner’ with whom to end the conflict and resolve all the complex issues such as borders, security, refugees and the division of Jerusalem. Regardless of whether this Israeli notion was accurate, it reflected the complexity of Israeli-Palestinian negotiations and challenged the underlying premise of the peace process – that through negotiations the parties could achieve lasting peace. Although the right-wing speaks openly about abandoning the concept of ‘two states,’ many in the Israeli leadership, including the prime minister, continue to speak out in support of the two-state concept, primarily in order not to appear to the international community as the party who turned its back on peace. The continued failure to solve the conflict after more than a decade of negotiations raises questions about the process itself, the maturity of the two sides, and the role of third party mediators. 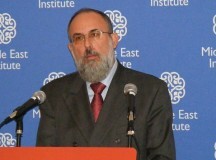 Yet while achieving a two-state solution remains impossible in the near term, the two-state paradigm remains the guiding concept for resolving the Israeli-Palestinian conflict, and Israelis, Palestinians and the international community continue to publically advocate for it, which hinders alternative ideas from emerging. Rather than searching for different paradigms to better handle the relationship between Jews and Palestinians in the geographical area between the Jordan River and the Mediterranean Sea, continued public support for the two-state paradigm has helped both leaderships maintain a situation that has served them very well. The ‘cooperation between rivals’ model offers significant benefits to both leaderships. It has enabled the Palestinians leadership to preserve its political power by offering the population economic advantages as an alternative to the peace agenda, and to enlarge the civilian and security bureaucracy that enables the PA to fight against political enemies like Hamas. At the same time, it has enabled the Israeli leadership to strengthen itself. It can offer security benefits to Israelis while ignoring the peace process in order to promote an agenda that concentrates on ‘day to day’ life and economic problems, such as the cost of living. Moreover, although the new dynamic revolves around an informal ‘deal’ between the Israeli and the Palestinian political elites, they have also succeeded in recruiting large sectors of their respective societies to the new order. More than 100,000 Palestinian day labourers benefit from a steady income and the ability to support their families as a result of the economic cooperation with Israel. Over 150,000 Palestinian civil servants in the civilian and security bureaucracy enjoy receiving a monthly salary and the social prestige in Palestinian society that their positions bring. At the same time, Israel’s middle class – the most important sector in Israeli society – has shifted its interest from matters of peace to economic problems. ‘Cooperation between rivals’ has also succeeded in making the Israeli-Palestinian system an island of stability when compared to the chaos experienced by others in the region. The foundations of this new dynamic have been strong enough to stand relatively untouched by the Palestinian violence that erupted in October 2015. Far from contradicting the new model of cooperation between rivals, the past year of violence has actually exposed for all to see the deep logic and strong foundations of the model, as well as demonstrating that significant parts of both societies have an interest in preserving the balance of the system. Unlike the first and second intifadas in 1987 and 2000, both primarily national in character, the main discourse surrounding the latest wave of violence has not been political. Instead, those involved have primarily focused on changing the main logic of the system created over the last decade – the model of ‘cooperation between rivals’ – because they were left behind by the new order and did not benefit from its economic and socio-political advantages. Three points can be made in support of this argument. First, the violence began in a Palestinian neighbourhood in East Jerusalem before spreading to the West Bank. It is the Palestinians in East Jerusalem who have been neglected by successive Israeli governments since June 1967, suffering for years from lack of decent living conditions. They were driven by similar motivation to the young generation of Egyptians and Libyans who saw their chances of integration in the new order as low and who were motivated to take part in the ‘Arab Spring’ because they were left out of the social order and did not benefit from the economic prosperity. Second, some of the targets of the terror attacks carried out in the last year were symbols of the economic system, for example the terror attacks carried out against settlers in the West Bank, who represent the social and economic dimension in the Israeli-Palestinian system. They also represent a sector who benefit from a different economic order than the Palestinians, who can only dream of having nice houses, tax reductions and quality of life like their Jewish neighbours. Another example is the terror attack in June 2016 at Sarona Market in the heart of Tel-Aviv, a city that symbolises Israeli economic prosperity and the social gap between rich and poor in the Israeli-Palestinian system. Third, contrary to the first and second intifadas, most of the Palestinian public has not participated in the wave of violence, which has been neither popular nor massive. That is why the Israeli media coined the phrase the ‘lone wolf intifada’ rather than the ‘third intifada’. The Palestinian security apparatus has not taken part in it and Abu Mazen and the political leadership have played a cautious role. On the one hand, Abu Mazen blamed Israel for its policies that led young Palestinians to take action. However, despite how unpopular security coordination continues to be among the Palestinians, he persists with it in order to avoid an escalation in violence. The current level of violence thus reflects the stability of the new dynamic. AS a model, ‘cooperation between rivals’ not only makes the Palestinian-Israeli system more stable, but encourages conservatism by incentivising both sides to preserve the current situation. It is a model that has arguably minimised the disadvantages of the current strategic situation, giving preference to the certainty of an imperfect present over the uncertainty of the future. It also explains the main reason behind the lack of progress in the peace process – the fact that neither side has the motivation to take the steps in order to resume negotiations. Nevertheless, despite the stability it provides, the system of cooperation between rivals fails to offer any serious answers to the moral questions posed by current Palestinian-Israeli relations. It facilitates the continuation of the occupation and infringes on the basic human rights of the Palestinians. Furthermore, it maintains a socio-economic dimension of inequality between both Jews and Palestinians and between those Palestinians connected to the elites and those who are not. Such expressions of immorality and inegalitarianism cannot exist forever and there are already weak signals warning us that the ‘cooperation between rivals’ model is not sustainable in the long run. Although the current wave of violence has demonstrated the strength of the system, it also reflects the fact that other parts of Palestinian society have been excluded from it and oppose it. The current system is dependent on Israel and on the capability of the Palestinian leadership to provide the Palestinians with more than simply economic benefits. The Palestinian municipal elections that were due to have been held in October 2016 would have offered the people in the territories a political agenda with meaning. Their cancellation, coupled with continuing violence, indicates the political difficulties facing the PA leadership, which could ultimately lead to an internal uprising against Abu-Mazen and the traditional Palestinian political elite. Such a scenario has the potential to cause anarchy in the West Bank as well as political instability in the PA that might lead to internecine violence among Palestinians or against Israel. A similar scenario is possible when Abu Mazen exits the political scene. Moreover, although Israel currently cooperates with the PA there are a number of voices inside the government advocating a different approach entirely: ending the last symbols of the Palestinian national ambitions, such as the PA and the Palestinian national leadership, and replacing them with local Palestinian rulers that will come from the Palestinian municipalities. The election of Donald Trump, who is considered by many Israelis as supporting the right-wing, might also strengthen the motivation to attempt to implement such a strategy. The fact that the current reality seems to be stable and appears to serve the interest of both leaderships is not an indicator for how the future will look. For this reason, thought must be given to the possibility of renewing dialogue between the two sides. This does not necessarily mean a return to the traditional concept of the two-state solution as the main paradigm for resolving the conflict. But it does mean that both sides – with or without the help of others – should engage in a new effort to resolve the conflict in a manner that can create the best future for the next generations of Israelis and Palestinians.